There are instances where creativity and working with what you’ve got can alter the result for the better. That is the case of Tile Spacers. In art, for example, those who broke the rules and put their imagination to work were able to create new movements that defined an entire generation. The same goes for gastronomy: getting creative when you don’t have all the ingredients you need and using substitutes can often lead to a recipe that is more delicious than the original. When it comes to tile installation, however, precision and rigorousness are paramount to the success of a project. Using a substitute for your tile spacers, for example, may seem like a safe approach. But, as many tile installers have learned the hard way before you, the right tile installation tools can make or break your project. Using a substitute will, at best, increase the time and effort you need to spend on tiling. But, more often than not, this oversight can lead to damage to the tile, the tool and even yourself. The variety of tools that are essential for an installation project is immense. However, in this article, we want to focus on a small piece of equipment that a lot of installers often neglect. We’re talking about tile spacers. For a long time, professionals have used nails, screws, ropes, and even sticks to keep tiles at the proper distance from each other during an installation project. These tools were hard to work with, ineffective and made the entire process difficult and challenging. Thankfully, in the 1950’s, Bob Jobs invented the tile spacers, a cutting-edge piece of equipment that facilitates the placement of tiles and ensures uniform spacing between them. Even today, tile spacers are the best and easiest way to ensure that your tiles are set at the correct distance from each other and that the result is even, polished, and professional-looking. Do you need more reasons for why this essential tool should be in your arsenal? Tile tends to expand when the room temperature reaches a certain level. That is why you should never install tiles next to each other and always leave a small space between slates for the grout lines. That is where tile spacers can come in handy. A tile spacer is a small piece of plastic that enables you to line slates properly and maintain the correct distance between them. They come in a variety of shapes and sizes (we’ll discuss that later) and can be made of plastic, wood or ceramic. While keeping tiles equally distant is their main purpose, spacers have a few other applications too. For example, you could use them as a separation point when the tile meets the wall and create expansion joints. Spacers have great utility for both floor and wall tile installation projects. In other words, you could use a floor tile spacer for a wall tile project, as long as you have the right shape and size. Don’t assume that you can use this versatile piece of equipment only when you install the tiles. They can be extremely useful when you dry-lay the tile and create the initial outline. That way, you can get an accurate overview of how the project will look like as well as exact estimations of where you will need to place the tiles to get an even look. As mentioned already, spacers come in a variety of types and sizes. Keep in mind there isn’t any one-size-fits-all solution, and you must choose the right size and shape based on the requirements of your project. X-Shaped Tile Spacers: Use this type of spacers where four tiles meet. Their size varies from 1/16 inches to ½ inches. T-Shape Tile Spacers: Use this type of spacers wherethree tiles meet. Their size ranges from 1/32 inches to 3/8 inches. Horseshoe Spacers: Also known as U-shaped shapers, this type is ideal for countertops, especially if you want to level the surface material before adding the cement board. They are available in a variety of sizes, such as 1/16, 1/8 and ¼ inches. At the most basic level, spacers have a pretty simple purpose: they will allow you to keep the tiles at equal distance, enabling you to space them correctly and get a symmetrical result. However, their benefits don’t stop there. Here’s how tile spacers can make your life easier and ensure that the installation process goes a bit smoother than before. It doesn’t matter how hard you’ve worked to measure and prep the surface before installing the tiles. If the grout lines are uneven, then the final result will look messy and unprofessional. That is especially true if you’re using a grout color that stands out against the tiles. Spacers are an excellent way to ensure that the grout lines are uniform and well-proportioned. Accuracy and uniformity are two of the keywords of a successful installation project. Just think about it: if just one of the tile slate is slightly off-center, then it will jeopardize the appearance of the entire layout. Spacers make it easy to ensure the precise alignment of floor and wall tiles and achieve a uniform and constant look. That way, you won’t risk having the tiles at the edge of the floor set further apart than the ones at the center of the surface. One of the reasons you should use spacers when you’re dry-laying the tiles is that you can see what grout width works best with your pattern. That way, you can make adjustments to the design and enhance the appearance of the final result. You may think that after years of experience, you don’t need spacers to tell how and where you should place the tiles. You would be wrong. Savvy installers know that every tiling project is different and even a formed eye can’t observe all the subtleties of the surface. Place the tiles too close together, and you risk damaging the material when the slates expand. Spacers, however, enable you to determine the exact distance you need to leave between tiles. As such, the surface you are creating is safer and more durable than if you were to guess the tile placement. Tiling without spacers is not only extremely difficult but also time-consuming. You need to stop constantly and adjust the tiles so that you get an even layout. With a tile spacer, on the other hand, you will spend less time agonizing over the width and accuracy of your lines. As mentioned already, you can’t just pick any tile spacer and call it a day. You need to consider the requirements of your project before you can determine what size and shape of the spacer will benefit you best. For starters, discuss with the client the amount of space they want to have between the tiles. Remind them that the distance will also function as the width of the grout line and make some suggestions if you believe that their expectations are a bit unrealistic. Consider the surface you will be working with as well. If the baseline is uneven, then let your client know that they should opt for small spaces between the tiles to create a uniform appearance. Not only that, but this approach will also increase the durability of the tiles and reduce maintenance costs significantly. Last but not least, you need tile spacers that are sturdy and reliable, and that won’t break at the first use. 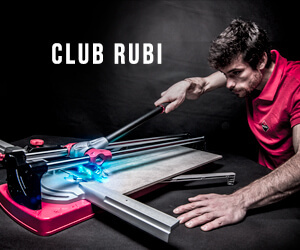 Rubi tools are among the best. You can find a wide variety of spacers, perfect for a wide range of installation work. Their uniformity and durability of these Rubi spacers will help you obtain an excellent finish and with outstanding accuracy. When it comes to tiling, the right tools can make the difference between a successful project and one that will require extensive maintenance. Never assume that if you’re an experienced tiler, then your skills and expertise are enough to determine the proper placement of the tile slates. Sure, you may have installed one hundred floor tiles correctly. But, there’s no guarantee that the same will be true with project number 101. Tile spacers take the guessing out of any installation project. Not only that, but they make the job easier, more accurate, and less time-consuming. And, that’s a win-win scenario. You will finish the job faster than ever before, and the client will be more than satisfied with the result.